Random House Trade Paperbacks, 9780812972962, 400pp. 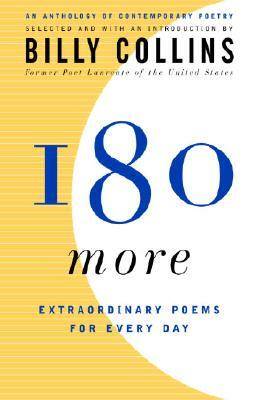 Come full circle with 180 new, exciting poems selected and introduced by Billy Collins. Inspired by Billy Collins’s poem-a-day program for American high schools that he began through the Library of Congress, the original Poetry 180: A Turning Back to Poetry was a gathering of clear, contemporary poems aimed at a wide audience. In 180 More, Collins continues his ambitious mission of exposing readers of all ages to the best of today’s poetry. Here are another 180 hospitable, engaging, reader-friendly poems, offering surprise and delight in a wide range of literary voices–comic, melancholy, reflective, irreverent. If poetry is the original travel literature, this anthology contains 180 vehicles ready to carry you away to unexpected places.